He liquidado las tres posiciones putt compradas en AMD. La de ayer bien, las de hace 3 días a 25 perdiéndole 1/3 y las lejanas, con las comisiones, para tomar un vino esta tarde. Al final palmar un poco. Había subido demasiado los dos días pasados. Precisión de cirujano o aguantar larga tendencia a favor, no hay otra. Chaqueta verde. He vendido 3 lejos y a jugar de nuevo. Se me ha pasado por la cabeza, incluso he puesto orden de comprar más. Déjalo, no la vayamos a liar. Se da la particularidad que al ser una acción cara y no alcanzar las 100 correspondientes a una opción, no se puede apoyar uno en las mismas para rascarle algo. Investing in Small Caps. Value Investments. The intelligent Investor. Recap of Conference Call on 3/13/19 and Independent Conference Call between NJ Biotech Expert/Mark Demitrack/Bob Yoder. Study protocol has been submitted to the FDA for QT interval data for Oliceridine with plans to commence study by end of 2Q 2019. Breakthrough Therapy status is no longer necessary to move forward with approval of Oliceridine. $61.5 million in cash & marketable securities, enough to last until 3Q of 2020 + $10 million direct offering on 1/30/2019. No additional safety data required to support 27 mg max daily dosage approval of Oliceridine. NJ Biotech Expert was lucky enough to have a personal conference call with none other than the Chief Business Officer, Robert Yoder, and the Chief Medical Officer, Dr. Mark Demitrack. We scheduled a call at 12:30 PM on Friday, 3/15/19, where I took specific questions from the investor community (StockTwits) and wrote them down to ask in order to gain clarity for any remaining questions that were not answered during the Earnings Conference Call on 3/13/19. They agreed to answer the questions as best as possible. Dr. Mark Demitrack was appointed as Chief Medical Officer in May of last year and Bob Yoder was recently promoted to Chief Business Officer. Mark has spent over 20 years in the industry and has a strong track record of leading numerous CNS programs to clinical development and approval. Bob joined Trevena in the middle of last year and brings over 30 years of industry experience, leading global business development and commercial functions, across a range of therapeutic areas including acute care. Both Mark and Bob have been instrumental in bringing the Company to this critical juncture. Breakthrough therapy status is awarded to early clinical programs to help expedite the drug development program. Trevena is far past early development with three Phase 3 trials already completed and an initial NDA submitted and reviewed. Therefore, breakthrough therapy will not impact the resubmission process or the timing of FDA's review of the Oliceridine NDA. In fact, Trevena is already in discussion about the potential Phase 4 study plans they'd like to pursue upon approval of Oliceridine. The FDA has stated that the QT study can be conducted in healthy volunteers over a 24-hour period and should include placebo and positive control arms. The necessary total sample size for statistical analysis will be determined once we receive feedback on our submitted protocol. However, in the Oliceridine cohort, FDA asked for at least 20 subjects to be exposed at a cumulative dose of 27 milligrams, which is a proposed maximum daily dose over a 24-hour study interval. FDA also indicated that no additional safety data was necessary to support the proposed 27-milligram maximum daily dose. A healthy volunteer study protocol and an accompanying statistical analysis plan have been submitted to the FDA for feedback. Trevena expects to initiate the study in the first half of this year, following receipt of FDA's feedback. This translates to commencement by the end of June 2019. In June of 2018, Trevena successfully completed its Phase 1 trial for TRV250, which proved its safety and tolerability supporting advancement of this compound into Phase 2. TRV250 is the first delta receptor ligand that has the potential to allow clinical testing of this receptor target without the risk of seizures in the expected therapeutic dose range. The preclinical and clinical data collected thus far suggests the potential for TRV250 to be the firstselective delta receptor modulator in the acute migraine treatment landscape. In Trevena's S1P receptor program, TRV045 holds promise as a new mechanism of action for the treatment of chronic pain and other CNS conditions. Modulation of the S1P receptor system is an established target for the treatment of neuro-immune conditions. The important aspect of TRV045 is that it decreases pain at the S1P receptor but does not result in the immune comprising activity typically seen with this class of compounds, namely lymphopenia and immunosuppression. Trevena plans to begin additional pharmacology work later this year and is evaluating a path forward for progressing this asset to IND, either through a potential partner or alone. Lastly, TRV734 is the orally available NCE with a mechanism of action similar to that of Oliceridine. Phase 1 data shows efficacy at the mu opioid receptor with reduced constipation and no evidence of opioid-induced hyperalgesia. Over the past year, Trevena has been working with the Intramural Research Group at NIDA who have been very interested in the use of TRV734 as an oral maintenance therapy for opioid use disorder because of its potential for an improved safety and tolerability over current standards like methadone and buprenorphine. TRV734 reduces drug-seeking behavior in a rat model of opioid relapse. NIDA is planning to begin preliminary studies of TRV734 in patients later this year. Therefore, Trevena is going to be a big part in helping to solve the Opioid Epidemic our country is facing. Cash, cash equivalents, and marketable securities were approximately $61.5 million as of December 31, 2018. This amount combined with the $9.2 million in net proceeds from the recent register direct offering together with interest income will fund operating expenses and capital expenditures into the third quarter of 2020. This amount includes operating cost estimates over this time period, including the Oliceridine healthy volunteer study, limited spending on TRV250 and TRV045 and the repayment of all debt which will be paid off in the first quarter of 2020. NJ Biotech Expert had the pleasure of speaking with Mr. Yoder and Dr. Demitrack in a personal conference call in order to ask questions from the investor community and gain some clarity from management. Based on the call, my outlook on the company is brighter than before with approval on the near-term horizon for Oliceridine and a full pipeline with promising upcoming trials. Many investors in the community are wondering whether there is a possibility that the sNDA re-submission of Oliceridine will be a Class 1 review in lieu of a Class 2 review by the FDA. A Class 1 review is a process that is only two months as opposed to the standard six-month review process. The FDA has already agreed that a 27 mg max daily dosage is acceptable and needs no further studies on safety or efficacy. Therefore, it remains a possibility that the FDA may, in fact, declare a Class 1 review on Oliceridine. On the other hand, standard review is 6 months, so for those looking to project based on time frame estimations, outlook should be kept at the standard 6-month review time frame as of now. The small QT study is the only study the agency has requested of Trevena before reviewing Oliceridine again. It has already accepted Oliceridine's proven track record of efficacy, safety, and now has accepted a max daily dosage. If you recall, I spoke about this QT Prolongation issue in my previous article FDA Minutes to Bring Trevena Back to Life. Trevena has already conducted a thorough QT study in the past with 58 patients at the 3 mg level, or the proposed dose, and 6 mg level, or the supra-therapeutic level. The results of the primary analysis found no evidence of any clinically significant effect of Oliceridine at the highest proposed clinical dose (3 mg) on cardiac repolarization. See below Figure 1, the light blue line represents the supra-therapeutic level, which has a short uptick over the mean at 1 hour and then drops back to normal levels. This one little uptick is the entire reason for this FDA test and one of the main reasons the FDA wanted more time to look into Oliceridine before giving the okay. However, if you look at the dark blue line in Figure 1, which is the proposed dose, you will see that it remains below the mean the entire time. An analysis of the relationship between plasma concentrations of Oliceridine and cardiac repolarization showed no evidence of a concentration-mediated effect. The great news here is that the FDA has not requested Trevena to test a supra-therapeutic dose in this new QT study, which means we will not see that uptick that we saw in the last QT test. The FDA will breathe a sigh of relief knowing that the proposed dose is safe and effective and warrants approval. Trevena expects to commence the QT study before the end of June 2019, of which the protocol design and data analysis plan has already been submitted and are awaiting feedback from the FDA. While the study is a 24-hour study, it actually takes roughly three weeks to complete, which is a very short and cost-effective study. Trevena is very pleased with the Type A meeting with the FDA, and it doesn't take much time to clean and lock the data once the test itself is complete. Trevena has a comprehensive plan to target early adopting hospitals who are receptive to new mechanisms of action relative to current standards of care. This implies that Trevena is seeking out the hospitals that are willing to take on a new chemical entity and use it as prescribed to better assist patients in their healthcare safety needs to decrease adverse effects. Instead of continuing to use IV opioids such as morphine, dilaudid, and/or fentanyl which has a beta arrestin recruitment of 89%-478% as shown in Figure 2, Oliceridine only has a beta arrestin recruitment of 14%. 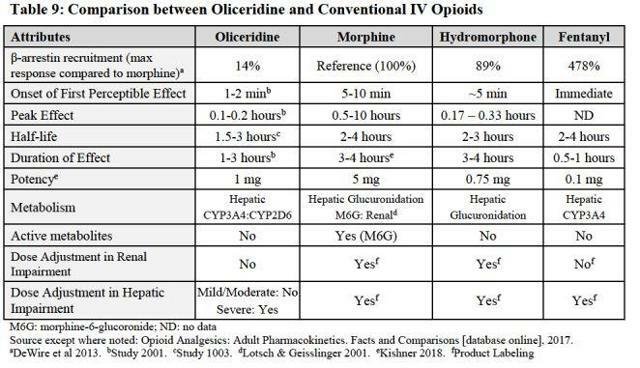 The data is very clear as to the effects Oliceridine has on adverse effects. The recent publication of Phase 3 APOLLO 1 data has been accepted for publication in The Journal of Pain Research and explains exactly this. Some important differences just to name a few are the respiratory outcome data, the gastrointestinal data, and CNS sedation data. These adverse effects from standards of care are extremely costly to hospitals and insurance companies and will reduce time spent in hospitals due to adverse effects. The price of Oliceridine is going to be roughly $60-100 and is representative of the true value of Oliceridine based on its efficacy, safety, and tolerability. It is going to be very competitive in cost with the current standards of care, which should assist the hospitals and doctors to provide it as another option for patients. Currently, Trevena has over $70 million in cash and cash equivalents to get them through to Q3 of 2020. The company will also be taking action after the Oliceridine approval to further strengthen its balance sheet. The specifics of how this will be done remains a mystery, however, I tend to believe a partnership agreement or two will be announced. Trevena has stated that they are open to the idea of partnerships and is on board with partnering with countries outside of the United States. Once Oliceridine receives FDA approval here in the United States, both China and South Korea deal officially begin. Trevena is generating income in the US, China, and South Korea, which will amount quickly. Due to postoperative nausea and vomiting being significantly reduced relative to morphine as shown in Figure 3, I am estimating many more countries will be interested in signing partnerships with Trevena. Trevena is proud of its robust pipeline and definitely wanted to convey to their investors that while Oliceridine is heading in the right direction, the company has an arsenal of new opportunities that will quickly be coming into focus. The Delta receptor, for example, clearly opens up opportunities in some psychiatric indications. However, migraine treatment is Trevena's primary focus because it is the best way to target engagement and test the novel drug. Migraines are an unmet medical condition in the current market with patients who suffer and do not receive relief from current standards of care. This opens up a major opportunity for Trevena with millions of patients in the United States alone, potentially hundreds of millions worldwide. My main question to Trevena was how they planned to gain back the respect and confidence of their investors after they let the community down by the FDA Briefing Document and the ADCOM decision. Their response was respectable and genuine. Both stated in response that they were aware of the investor sentiment from the previous mishaps with the FDA. They shared their frustration and stated that the company is doing everything in its power to gain back the trust and confidence of its investors. One way they attempted to do this was by letting the investor community know about the revocation of the Breakthrough Therapy Status that was given to Trevena by the FDA. Dr. Demitrack said that this PR release was not required by the FDA or any other agency for that matter. The reason they did release this PR was to prove to their investors that they are willing to be as open, clear, and transparent as they possibly can. This is a very good sign to me because it shows that the new management is understanding of investor sentiment and willing to do what it takes to prove itself once again. All in all, Trevena is well on its way to bringing Oliceridine to market within a year and the stock price is already reflecting the market sentiment of the most recent PR's and conference calls released. The future is filled with catalysts from Oliceridine and the rest of Trevena's pipeline which will bring the stock back to high single digits in my professional opinion. This is a Strong Buy with a 6-month price target of $4.25, which is a 130% gain based on current share price. NJ Biotech Expert would like to sincerely thank the investor community for its questions and Mr. Yoder and Dr. Demitrack for their cooperation in answering their investor's questions with poise and brilliance. Disclosure: I am/we are long TRVN. I wrote this article myself, and it expresses my own opinions. I am not receiving compensation for it (other than from Seeking Alpha). I have no business relationship with any company whose stock is mentioned in this article. os dejo el grafico con los detalles , jodo, lo tiene todo … pero vamos a decir aquello de … "pendiente de confirmación bla,bla,bla"
y no creo que haga absolutamente nada mas la próxima semana. a poco que hagan lo que creo que debieran hacer … me dan de comer para el resto del mes. Cuando vale 100 compro 100, cuando vale 80 compro 80 y cuando llega a 50 compro 50. Y si haces caso a los Gurús, que no se puede hacer, vas a perder todo! El sistema que me hizo rentable, sin tirar cohetes, pero rentable en chicharros. Cuando vale 100 compro 100. Cuando vale 80 compro 125 y cuando está a 50 compro 150. Siempre que no se vaya por el desagüe, funciona! Tras el vino a la salud de AMD y alguno más voy a ver cómo ha cerrado el cotarro. Vamos a ver en primer lugar el gráfico diario. Mi forma de ver el mercado es en precio y volumen. Estocástico y MACD están para, casi siempre, adornar. El volumen de ayer, del galletón, multiplica por 10 cualquier máximo de la temporalidad representada. Significa que se ha vendido muchísimo, exactamente las mismas acciones que se han comprado. Y quién ha comprado tantas acciones? Supongo que no serán unas señoras jugando al cinquillo en Winsconsin. Vamos a 10 minutos. La primera zona de recogida, de compras, es normal. Barato, barato. Se produce la primera lucha entre el pezqueñín que pierde sus ahorros y el que va a sacarle un pico. A Gekko no le interesa que se confíen, él mismo provoca el pánico, lo hundimos más que la flota es grande. Al cierre de nuevo volumen brutal, parece el IBEX. Hoy remoleamos todo el día, las olas no han ayudado, las cosas como son. De hecho andaba mirando el QQQ y calcaban prácticamente los movimientos, mucho más que el IBB. Goteo a la baja toda la jornada y al final, ingente pasta, que tampoco ayuda a pronosticar a corto plazo a dónde nos lleva. Mucha gente piensa, los TIBUS, como que van de la mano. Qué va. Anda que no se dan dentelladas entre ellos. Esta puede ser la causa de que no se gire, que se autodestruyan. Lo normal es que lo tiren hasta que la oferta esté agotada y se hayan hecho con la mayoría de la demanda. Ya sin oposición y sin que suelten los títulos saben que los tienen que aguantar para que el precio suba. Los volúmenes decrecientes cuanto más baja la cotización nos darán una pista importante. SPY parece que este minicrack de 2019 no llegó a RSI sobreventa mirando a 20y no?? ?